With so much information out there on the internet, it’s hard to stay current on news that’s relevant to you. Today’s post has links to articles that relate to topics I’ve written about on Jubilant Age. A quick read will help you keep up with recent web news on successful aging. According to the AARP, scam calls are “epidemic – and getting worse.” An estimated 4 billion robocalls were made last July in the US, up from 2.6 billion one year ago. It used to be the case that scammers focused on home phones, but now most people also get junk calls and texts on their cell phones. 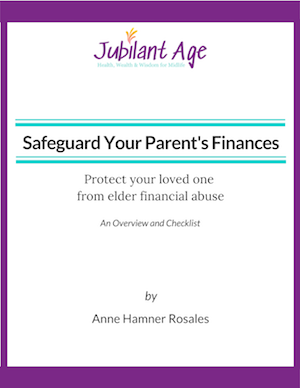 Seniors are especially vulnerable. Scam callers may allege outstanding debt or arrest warrants. It’s easy to be tricked into revealing private information in an effort to clear your name. Consumer Reports has a recent article on the best ways to fight robocalls. One of their suggestions is to install a call-blocking app on your cell phone. I’ve been testing Robokiller, an app that costs $2.99/month or $29.99/year (after a 7-day free trial). It doesn’t block all junk calls and texts, but it definitely cuts down on the volume of interruptions. Next Avenue, a terrific resource for midlife concerns, recently highlighted two new personal finance apps for people over 50. The first is Golden, an app that helps you manage your parents’ money. And the other is SMRTSVR, which helps freelancers and gig economy workers save for taxes. Both these apps address needs of people in midlife and older demographics. What is a plant-based diet and why should you try it? This post appeared on the Harvard Health Blog, a publication of Harvard Medical School. It defines a plant-based diet as one focused on plant-based sources of nutrition. Thus, in addition to vegetarian diets, researchers include the Mediterranean diet in their “plant-based” category. The post offers a science-based discussion linking food choices to health and longevity. Anti-inflammatory diet linked to reduced risk of early death. This post by thirdAGE cites a study published in the September 2018 Journal of Internal Medicine. The study followed over 68,000 Swedish men and women ages 45-83 for 16 years. It found that those who most closely followed an anti-inflammatory diet had 18% lower risk of all-cause mortality, 20% lower risk of cardiovascular death, and 13% lower risk of death from cancer. Renowned geriatrician Dr. Bill Thomas, an innovator in nursing homes, dementia care and more, recently published an article by Mary Fridley on his blog, ChangingAging. Called The Weirdness of Dementia (and Life), the post challenges you to let go of inhibitions and judgments about dementia and other weird things in life. The goal, Fridley says, is “to embrace our ‘otherness’ . . . in ways that allow us to move closer to, and create more intimacy with, the people in our lives.” It’s a change in perspective that can lead to growth and joy for the person living with dementia, as well as the people around him or her. Chickens: the next comfort animals? Therapy dogs have been around for years. Therapy horses work in programs that assist veterans, first responders, children and adults with various types of special needs. But therapy chickens? Apparently chickens offer relief to people struggling with anxiety, depression, isolation, loneliness and dementia. While chickens benefit people of all ages, researchers think they may be especially calming for older adults. Perhaps chickens offer a link to the past, in particular for people who grew up in rural areas. But pilot studies at retirement communities and nursing homes show positive effects from adding chickens. Resident-to-resident altercations have gone down. Anti-psychotic drug use has declined. And residents have received more visits from friends and family. Meditation is something you can do on your own, or in a group with other people. But don’t discount the potential of a chicken coop in your backyard, either! Last month Willie Nelson released his 68th studio album, My Way. The collection of eleven songs is a tribute to Frank Sinatra – who actually was a close friend of Nelson. Sinatra’s renditions, of course, are classic: it’s hard to believe that anyone could sing them better. But give Willie Nelson’s tribute to his friend a listen. Here’s the Spotify link to the entire album. You also can find it on YouTube. Every day brings news of another finding or piece of advice on how to live a longer, fuller life. I hope you enjoy these highlights related to topics we talk about here on Jubilant Age. For more web news on successful aging, like and follow Jubilant Age on Facebook. I’d love for you to share things you find with me in the comments or on social media. Itineraries may differ from person to person, but we’re all on this journey together.